TORONTO -- The refrigeration unit that will help transform Fenway Park into an NHL ice rink is on its way to Boston. The custom-built, 53-foot truck that houses specialized equipment used to make ice for the Winter Classic set off from Toronto on Thursday afternoon. It will make stops in Philadelphia and New York before arriving at Fenway Park on Dec. 10, when ice-making for the New Year's Day game will begin. NHL ice guru Dan Craig can't wait for it to arrive. He's spent time in Boston recently and felt the anticipation building for the Bruins-Flyers game at Fenway. "I get really excited," said Craig. "Being in Boston the last couple days, working with the people at the field and going over to the Bruins game last night and talking to all the staff there -- everybody's excited. "The city is just all wound up about this. They're counting down the days to this game." Craig says he feels less nervous than in the past because this will be his fourth outdoor game -- and third consecutive on Jan. 1. 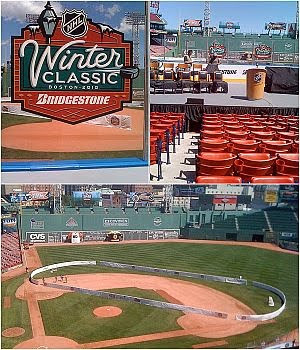 The layout at Fenway will be similar to what he had last year at Wrigley Field in Chicago, with the ice being angled across the infield of the baseball diamond. It's also easier now that the league has its own refrigeration unit. The truck was purchased after the 2007 Winter Classic in Buffalo and allows Craig to make ice in weather as warm as 10 C.
"The biggest challenge that we had when we came out of Buffalo was that we were using a rental system," said Craig. "There was a lot of parts of the system that needed to be upgraded. When we came out of Buffalo, we knew that this was going to be a big project, we just had a meeting and decided we'd be better off going out and building one ourselves, getting state-of-the-art (equipment), getting something that's brand new." It's also a sign that the league is invested in the Winter Classic, an event that has quickly become an important part of its schedule. The Fenway Park game is already a sellout, with all 38,000 available tickets accounted for. More than 307,000 people entered a lottery to try and buy seats. One difference from years past for Craig is that he'll need to have the ice surface ready by Dec. 18. Prior to the Jan. 1 game, the Bruins and Red Sox will be renting out to the public one-hour sessions on the rink for between $7,500-$10,000, according to a recent report in the Boston Globe. Craig, who spent 11 years with the Edmonton Oilers prior to joining the NHL, is grateful for the extra time he'll have to monitor and perfect the ice. "I'm not as familiar with the East Coast weather," he said. It will take 200 workers roughly two weeks to turn the iconic baseball stadium into an ice rink for the Winter Classic. They'll use 52,000 feet of plywood, 32,000 square feet of decking and 20,000 gallons of water to construct the rink. Craig will be there to oversee the entire operation. His journey started Thursday as the mobile refrigeration unit set off on its 1,300-kilometre trip to Fenway. "It's the start of six long weeks," said Craig.